"Welcome to the new Greenfield Housing Authority website, dedicated to providing the Greenfield community with information on the work that we’re doing to make the town a better place for citizens to live and work. We redesigned our website to make it more user friendly, informative and timely for those who live and work in the Greenfield community." 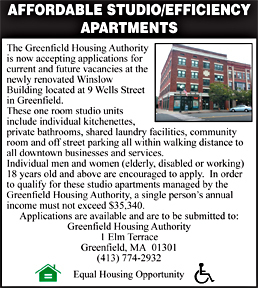 The Greenfield Housing Authority’s (GHA) mission is to provide safe, decent and sanitary housing conditions for low-income families and to manage resources efficiently. Its purpose is to promote personal, economic and social upward mobility and to provide families the opportunity to make the transition from subsidized to non-subsidized housing. 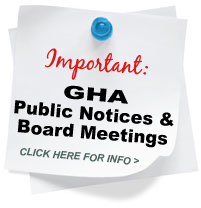 The GHA was formed in 1946 by an action of Town Meeting members after having determined a need for housing. On April 13th of 1946, the Secretary of the Commonwealth of Massachusetts issued a Certificate of Organization. 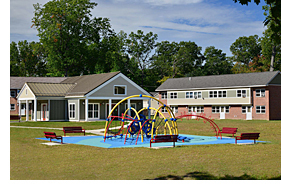 The GHA first developed 72 units of Veterans housing in 1949 and since that time has gone to develop elderly housing, congregate housing for the elderly and disabled, family housing and a group home for individuals with special needs. In addition, the GHA has been chosen as the management agent to oversee the day to day operations of the newly renovated Winslow Apartments located at the corner of Main and Wells Street in downtown Greenfield. The Winslow Apartments provide 55 units of Single Room Occupancy (SRO) housing which serves a critical need for housing single individuals. The GHA has also participated in a number of other programs to revitalize downtown properties including SHARP, Core Focus and 705 Moderate Rehab. The GHA administers both state rental assistance (MRVP) and federal Housing Choice Vouchers (HCV) used by eligible households in privately owned apartments. The GHA has also developed a successful Family Self Sufficiency (FSS) program that is designed to assist families to become self sufficient and free of government assistance. Please be advised that by accessing and browsing this site you acknowledge that you have read, understood, and agreed to the following without limitation or qualification: this Greenfield Housing Authority web site is meant to provide you with information and education related to housing and rental assistance. You may download the contents for your personal, non-commercial use only. While every reasonable effort has been made to include accurate and up to date information on this site, GHA makes no warranties or representations as to its accuracy and assumes no liability or responsibility for any errors or omissions in the content on this site. The Greenfield Housing Authority is not responsible for the contents of any off-site pages or any other sites linked to this site. Your linking to any other off-site pages or other sites is at your own risk. For an application, click here > Preliminary Application.